Off the Beaten Path: Going Rogue or Just Off the Beaten Path? Going Rogue or Just Off the Beaten Path? For a 40-something year old journalism major I seem to have to look up an awful lot of words in the dictionary these days. Add one more to the ever-growing list. Rogue: resembling or suggesting a rogue elephant especially in being isolated, aberrant, dangerous or uncontrollable. I'm not sure this is the definition Sarah Palin or her editors had in mind when they chose this title for her autobiographical book, nor am I sure it is the one her handlers were referring to when she continued to push their buttons and frustrate their micromanaging plans. But it does seem to fit. In a good way that is. 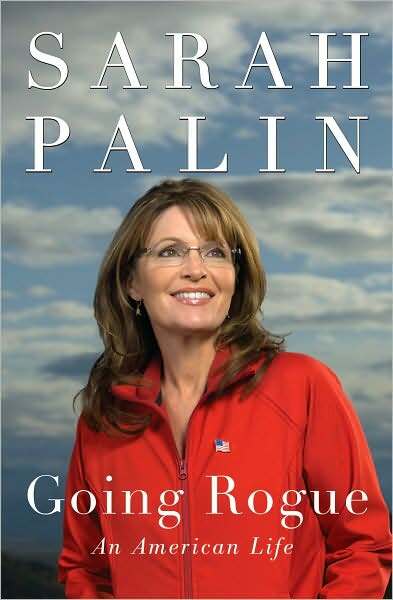 I don't want to turn this blog into a political format, so I will try to steer clear of polarizing ideology in this post, but I do want to give my take of Sarah Palin's Going Rogue, which I just finished reading a couple of nights ago. If you suspect my take, reflected in the title of this post, might offend you, I urge you to click away for today and come back tomorrow. Palin got jerked around a lot by both the liberal media and her own handlers and still came out with her integrity in place, her marriage strong, and her ideals high. Hats off to Palin for that. I'm not sure a lesser woman could have managed the intense scrutiny, the biased reporting, or the duct-tape-on-the-mouth approach that her handlers insisted on. I say that not because she presented herself in her book as being in the right at all times. Quite the contrary, I say it because she comes across as self-effacing, humble, and genuine in her book. She is definitely a woman with a great deal of confidence tucked into her back pocket, but she writes as one speaking from a good, good heart, not with the typical political speak that sounds more like a whine than an answer. Palin is a godly and God-fearing woman. I'm not sure she and I have all the same theological positions on things, but I also didn't see any ideology or beliefs in her book that sent up glaring red flags for me either. She speaks throughout the book of a personal relationship with God, of a time when she asked Him to take control of her life, of tithing and being a good steward of all God has given to her, and of a personal accountability to Him. Right now, to be honest, I cannot remember if she mentioned Jesus specifically or if she kept her references to the Lord a little more veiled, but I don't remember ever wondering if she was a Jesus-follower as I read the book. That came across loud and clear. And that in itself is quite a brave move on her part, as one who undoubtedly still has some political aspirations. Politics in this country is a mess. Not only are most politicians giving us double talk, but they are handled by political experts who have convinced them that only they can get them elected through careful and yet convoluted maneuvering. Though I voted for John McCain in the final election, I am disappointed to learn that even he seems to have fallen into step with such shot-callers with way too much ease. Not that Palin had anything negative to say about her presidential candidate; she didn't say or imply a single unflattering thing about McCain. In fact, she spoke of him to the end (and even now) with great respect and love. But it is obvious that even this very honorable and good man allowed others to run his and Sarah's campaign into the ground. I'm not sure they would have won had they kicked all the handlers off the campaign buses either, but I sure would have preferred to see that campaign over the one we witnessed. Palin is someone I could call friend. I'm not sure we would ever get to be friends. She is extremely smart, confident, and sharp. If her busyness and political savvy didn't keep us from walking in the same circles, then my feelings of inferiority in her presence probably would. I like her. She seems fun, genuine, likable, and all woman. She knows her strengths and weaknesses and I get the feeling that she very willingly allows others to help fill in the gaps left by those weaknesses. She is very much a team player and team leader. She knows exactly where Russia is and the extent to which Alaska is associated with it, by the way. She's no fool, so if the media left you with that impression, think again. I like her as a mother and wife. This woman knows what she's doing, not only in the political arena, but also in her home. She defers to her man, honors her marriage, blesses her parents and siblings, cherishes her children, and prays for each of them constantly. She is, in fact, a woman of prayer. Once again, I'm not pushing my political views here, but wouldn't it be nice to have a praying woman in Washington? I know there are a few already, but we could certainly use a few more government leaders who do more than attend a National Day of Prayer breakfast, for pete's sake! "I had to stop walking for a second. I rarely stop. I sat down on the grass and prayed, 'God, thank You. Thank You for Your faithfulness...always seeing us through...I don't know if this chapter is ending or just beginning, but You do, so I hand it all over to You again. Thanks for letting me do that.' Then I thanked our Lord for every single thing we'd been through that year. I believed there was a purpose in it all." So that's my take on Palin. Bottom line, I like her. Comments are open, but keep it sweet. Like I said, I'm not trying to be political, but I did want to share with you my take on one godly woman who may or may not have gone rogue, but she definitely went off the beaten path. Good for her.